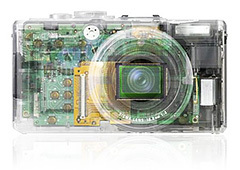 I've been reading up on the just-announced Sigma DP2 compact camera, and I have to say, I don't quite get it. I do understand that it uses the same 14 megapixel (2,652Ã—1,768Ã—3 layers) direct image sensor as the SD14 and DP1, which is huge for a compact. But the lens is a prime only at 24.2mm (equal to 43mm on a full frame sensor) with a maximum aperture of f/2.8. Now, I love prime lenses as much as the next guy, but this day in age, why would I spend hundreds of dollars on a camera with only a 43mm lens? And at f/2.8 to boot? If it's going to be a single-focal length only, doesn't it at least have to be fast? I understand the potential for great image quality here with the large Foveon sensor and shooting in Raw mode. And quite possibly I'm just a little more frugal than the target market for this camera. So, if you have a compelling argument to spend big dollars on this machine, I'd like you to post a comment saying why. I have been wondering the same of DP1, to which this applies even more. Another wonder: if I have understood right, there is not image stabilization, and at high ISO the sensor is really noisy. But I guess the market for a large-sensor compact exists, and even halfway good cameras can survive there. I have been told that in optimum conditions the DP1 really shines. Haven't seen proof of that yet though. Well let me try to explain the allure. One, a lot of people have grown out of the acid trip extreme wide angle approach that so many photographers seeem to adore. 43mm is a lot closer to a natural view, like how we really see..... as far as speed of the lens. F2.8 is plenty fast if you can shoot at iso, 200,400,800 and so on. So the lens isn't a real issue if we keep the noise down on the higher iso settings. Its oh so portable, the Foveon puts out unique photos, more film like. IQ is amazing, it has raw and oh did I mention it weighs 9oz. I can't wait to put my DSLR down and pick this unit up.